The 29th Annual Wildlife Crime Enforcers Conference took place between Friday 24th and Sunday 27th November 2017. The winners of the 2017 Wildlife Crime Awards have been announced at the 29th National Wildlife Crime Enforcer’s Conference. The awards celebrate the hard-working and dedicated law enforcers who have gone above and beyond to tackle illegal wildlife trade and wildlife crime in the UK. 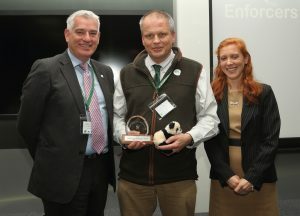 The winner of the Lifetime Achievement Award was given to Chief Inspector Martin Sims, head of the National Wildlife Crime Unit. His 30 years of commitment to tackling crime has culminated in thousands of pounds worth of illegally traded animals and their parts being uncovered, and many native species in the UK avoiding persecution. One of his biggest achievements and largest busts was preventing 14 peregrine falcon eggs, worth £70,000 from being illegal traded out of the UK. The Police Service of Northern Ireland (PSNI) was awarded ‘Wildlife Crime Operation of the Year’ for their incredible work on ‘Operation Peregrine Watch’. Their innovative use of drones to monitor breeding sites has led to a 12% increase in peregrine nests in Northern Ireland. The final award was presented to Sergeant Kevin Kelly of the North Yorkshire Police for ‘Wildlife Crime Enforcer of the Year’. He has been instrumental in transforming the way that wildlife crime is dealt with in the north and demonstrated how collaborative work with charities such as the RSPB can help to protect our native wildlife. Sgt Jamie Bartlett from Hertfordshire Police also won a Lifetime Achievement award.